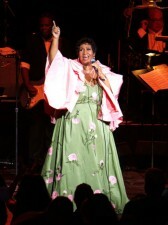 Aretha Franklin has entered that phase of her career where she shows up in public mostly to receive awards. Picking up a bauble the other night in D.C. she mentioned that she will appear with Tony Bennett on the stage of the Metropolitan Opera House this Sunday, along with Elton John. Re-Re also mentioned that the biopic of her life is moving along. Even though Halle Berry not long ago dropped out of consideration for the star part, Aretha says, “I think Halle Berry’s gonna get it.” As if every star in the world wanted to play her! Will Halle FINALLY Play Angela Davis? Halle Berry: Shoe Addict or Maid?